Described by many as a living canvas and mainly known as the birthplace of the Renaissance, sophisticated Florence is impressive with its grand palaces, beautiful churches and priceless art collections. 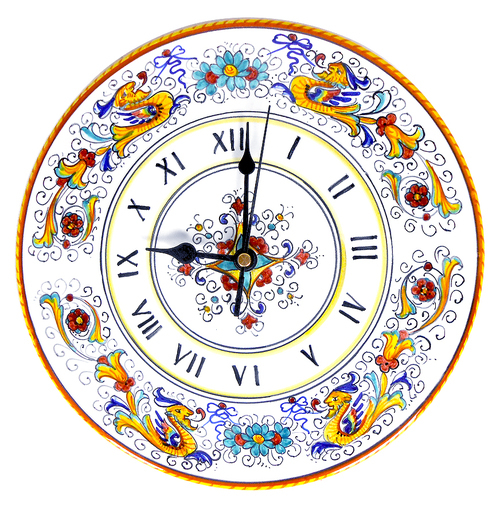 It is not for nothing that Florence epitomizes the wealth and extravagance befitting a European cultural capital. Yet this is not the greater story. It would be rash to conclude that Florence is simply the centre of some of the greatest artistic and architectural achievements of early Renaissance Europe. In my opinion, there is something infinitely more important. Whenever I visit Florence I also think of the perennial and bitter struggles, of the feuds and hatred that existed between ruling families, of the volatile politics and the conspiracies that were centre stage of Florentine life during the Middle Ages and during the 15th Century. No less important, is the strong literary heritage that has resonated through the centuries to give us some of the masterpieces that remain pillars upon which much literary heritage owes a debt. It is a heritage that began and manifested itself in an unprecedented shift in tradition. But what was this shift? And more importantly, who was actually responsible? Florence is intimately associated with the writings of Giovanni Boccaccio and Francesco Petrarca. They were, unquestionably, responsible for the burgeoning literary achievements that made Florence stand out from the rest of Italy. For me, however, the centrepiece of Florentine (and Italian) literature rests with Dante Alighieri and his magnum opus, La Divinia Commedia (The Divine Comedy), a long vernacular poem composed during his long exile from Florence. 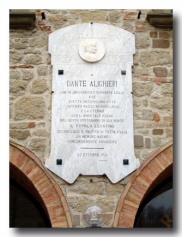 Dante Alighieri was born in Florence on the 29th May 1265 into a well to do Guelf family of noble descent. His reputation as the most outstanding and prominent figure of European literature and poetry must rest, arguably, with the Divinia Commedia (although other important works include La Vita Nuova in which he celebrates his love for Beatrice, De Vulgari Eloquentia, a treatise on his native language, Il Convivio, a collection of verse, De Monarchia, which was burned by the order of Pope John XXII and Quaestio de situ aqua et terra, a scholastic treatise on science). The Divine Comedy is a magnificent synthesis of an imaginary medieval world. But the clue in understanding how he influenced modern literature with this work lies with the emotional, political and ecclesiastical influences of Dante’s own life which provided the setting for the poem, for it recounts his own journey through some restless and turbulent times. There’s a twist to the story and it is personal. For Dante, the decline of Florence was seen as a general world decline into sin and corruption. The characters that Dante meets on his journey are drawn largely from ancient and classical history, but many include his personal friends and enemies. His graphic portraitures and constant allusions to human nature are a profound analysis and evaluation of every aspect of life. The Divine Comedy is also an allegorized and generalized representation of the progress of the individual, a wanderer searching for spiritual treasures as it were. In his youth Dante served with the Florentine Army and fought against the Arretini at the battle of Campaldino in 1289. He was also present during the capture of the Fortress at Caprona, near Pisa (following the treacherous death of Count Ugolino della Gherardesca, the former podesta’ of Pisa, who sided with the Guelf forces of Florence and Lucca in order to stave off further attack from Pisa’s enemies, Florence and Lucca captured Caprona as part of an vengeful offensive against the Pisan Ghibellines). Intensively active, compassionate and possessing a clear sense of moral convictions, Dante later played a prominent role in Florentine politics. He served on the Signoria of Florence and later became ambassador to Rome. In 1300 he was appointed to the position of City Prior. During this time, however, the Guelfs had split into two factions – the Whites who were against papal interference – and the Blacks who sought closer political ties with the church. The two opposing factions had caused much widespread civil unrest in Florence. But Dante opposed the political intentions of Pope Boniface VIII and in his role as civic leader subsequently exiled, among others, Corso Donati, the head of the Black Guelfs. The trouble with this decision was not only that Donati was related to Dante’s wife, more importantly, it also earned the enraged Pope’s displeasure. This decision, together with the Signoria’s intransigent attitude towards the papacy eventually led to Dante’s own irrevocable and perpetual exile. In 1301 when the imperialist Ghibellines had regained power, Dante’s political enemies wrongly accused him of fraudulent use of public money. He was banished for life from Florence with all of his wealth and property confiscated, although his wife and children would remain safe. During his solitary exile Dante was never to set eyes on his beloved Florence again. He visited many courts and served various princes and he supported Henry VII the Holy Roman Emperor as the potential savior of a united Italy. He died of malaria at the age of 56 in September 1321 whilst serving the court of Guido Novello da Polenta in Ravenna. 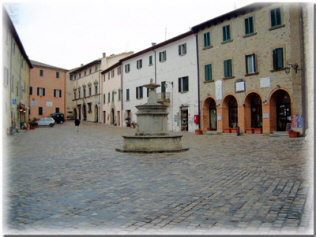 He is buried in a tomb that stands adjacent to the Basilica di San Francesco. La Divina Commedia was written during his exile and occupied eighteen years of his life. This literary masterpiece led to an unprecedented shift in tradition, breaking the mould of conventional clerical wisdom and establishing the Tuscan dialect as the literary language of Italy. For Dante, drawing upon his earlier studies in philosophy and theology, his uncompromising high-mindedness and independence of mind not only made him challenge the political doctrines of his day, he also opposed the clerical assumptions and traditions that prescribed Latin as the only language worthy of a great subject. Moreover, he advocated the use of a single language enriched by the best dialect that each Italian region had to offer. This, he believed, would not only bring unity and peace to Italy but also create a truly national culture, an end to which Dante passionately believed in and aspired to throughout his life. For me, Dante and his Divine Comedy hold an important place in literary history. That the development of the Italian language from his Tuscan dialect was to be such a landmark and momentous change, spearheading the new humanist renaissance culture, has really only emerged over the centuries. In short, Dante was a great man whose intellectual conviction and influence played a leading role in shaping Florence, although it may extend beyond the literary to influencing the political dream of a unified Italy. But the impact of his work upon our literary heritage has undeniably earned him his place in history. A fact that is today, acknowledged by the immortal title of divino poeta or divine poet. 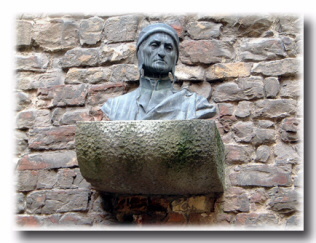 La Casa di Dante – Via Santa Margherita, Florence – the site Dante’s birth and now housing the Dante Museum. Places of interest cited in the Divine Comedy reflecting the places Dante visited throughout his life and during his exile.